This post contains affiliate links. If you make a purchase you won’t pay extra and I’ll make a small commission. You remember that Peanut Butter Magic Shell we made a few weeks ago? Remember how good it was over a scoop of vanilla? And how you turned right around and made it again as soon as you finished the last jar — come on, I’m not the only one… Well, never satisfied with just a topping, I decided it needed to go “in” the ice cream. Peanut Butter Banana Ice Cream. This dessert would never have happened a few short years ago, before my daughter left for college. Aside from her peanut allergy, which made our house a sad – Jif and Skippy free zone, she also had a distinct dislike for banana. If I’d made this then, it would have been accompanied by gagging and dry-heaving noises to punctuate her displeasure. No more. The kitchen is MY FREE REIGN. Long live the queen! Um, yeah. Chest-pounding aside, peanut butter and banana is a classic combination — ask Elvis. He knew.
. She has a completely different method for making the ice cream and when I tried it, I found it worked beautifully. The ice cream is smooth and creamy, never icy. Since Peanut Butter Magic Shell is made to harden on contact and break apart when nudged with a spoon, it just makes sense that this would work to create chunks of rubbly, peanut butter nuggets, just waiting to be excavated from their chilly banana suspension… like veins of gold during the mining days. This batch made about 1 1/2 quarts of ice cream and between the two of us, it was all gone within a few nights. Maybe it was the 18-year peanut butter/banana hiatus that made us eat it like Joey Chestnut at the Nathan’s Famous Hot Dog Eating contest on the 4th of July, or maybe it was just that good. You be the judge. 3 over ripe bananas the blacker the skin, the better! Freeze your ice cream maker's canister if required by manufacturer's instructions. In a small bowl mix 2 tablespoons of milk with cornstarch to make a slurry. Set aside. In a medium bowl, combine the cream cheese and salt. Use a hand mixer to beat until smooth and combined. Set aside. Combine the remaining milk, cream, sugar, corn syrup and vanilla seeds into a large saucepan. Bring to a rolling boil over medium high heat; boil for 4 minutes. Remove from heat and whisk in the cornstarch mixture. Return to the pan to the heat and bring to a boil, whisking constantly until mixture thickens, about 1-2 minutes. With hand mixer on medium speed, add the cream mixture in a steady stream until combined. Mash bananas (by hand for a chunkier mix - or in a blender for a smoother texture) and add banana puree to the cream mixture. Stir well to combine. Cover with plastic wrap and refrigerate until well chilled, at least two hours or overnight. Transfer the custard to the ice cream canister and churn the ice cream according to manufacturer's instructions. While ice cream is churning, heat the Peanut Butter Magic Shell until liquified, but not hot... Usually one to two 20-second bursts in the microwave, stirring in between will do it. 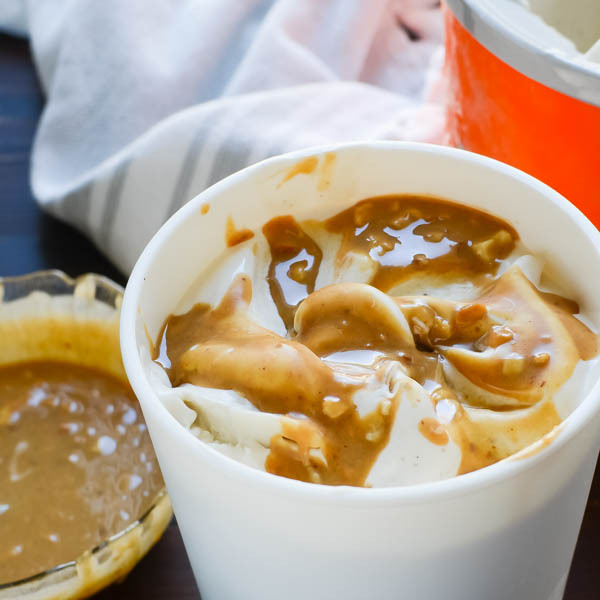 When ice cream is done, alternate spooning ice cream with peanut butter magic shell into a container, so that there are chunks and swirls of peanut butter throughout the ice cream. Freeze ice cream for at least 4 hours or until firm. Serve. Enjoy it! One of our favorites! Oh my! As if the hard shell couldn’t get any better you swirl it into the ice cream. Brilliant! Oh yum. My son loves peanut butter and banana sandwiches, so I’m sure he’d LOVE this! Peanut butter and ice cream- the two best ways to my heart. Cannot wait to try this! I LOVE when ice cream has the hard pieces of peanut butter swirled right in, OMG so good! This ice cream looks to die for! 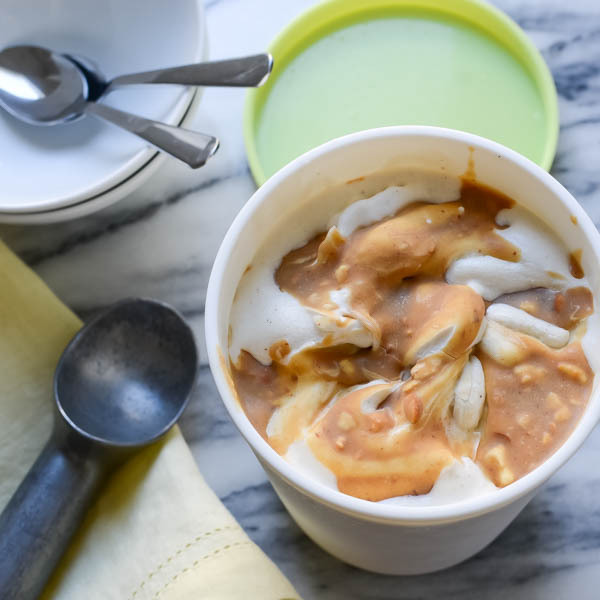 I love that too – and this peanut butter swirl is solid until it touches your tongue — then it melts into a creamy, delicious peanutty lusciousness. Clearly, nothing will be right in the world until I am eating this. It looks incredibly crave-worthy! PB and banana is in my opinion one of the finest in the world combos. Banana and peanut butter is just the ultimate combination. I wish I could open my freezer and see a tub of this in there right now. Well, it’s not hard to make, so…. That looks fantastic, bananas are my no go food a really dislike them but I love banana ice cream, go figure… It is a texture thing I hate the texture of bananas but don’t mind the flavour at all pairing it up with peanuts is genius. You are not the first person I’ve heard that from. In fact, one of my daughter’s friends has a whole list of “textures” that turn her off from certain foods. LOL! The icecream looks so good! Just love how you put together all steps and nicely explained everything.You have a nice collection of icecreams too! Thank you! Glad you like it — this ice cream is getting made again — and soon. Love this time of year when we get to make these great tasting cold treats! Peanut Butter and banana sounds fantastic! I could so use a big batch of this right now! I would be so sad if I had a peanut allergy. This looks absolutely delicious, pinned for later! Peanutbutter and bananas is suuuuch a delicious combo! 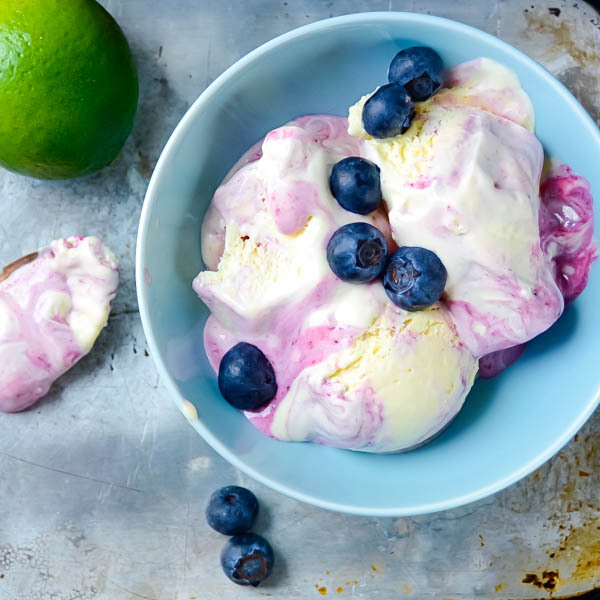 My ice cream maker has been tragically underused this summer–time to change that! Definitely time to break out that poor, ignored gadget! Jeni’s ice cream is the best! I live in Ohio so I’ve only eaten the ice cream that’s already made – but I keep saying I need to try her recipe at home too. Loving this flavor combo! Thanks, Jill! If you love Jeni’s ice cream, get the book! This looks so yummy! I love all of your process photos outlining the process.